In the congested environment of nearly all commercial industry, businesses are constantly looking for ways to separate themselves and add value to their customers. 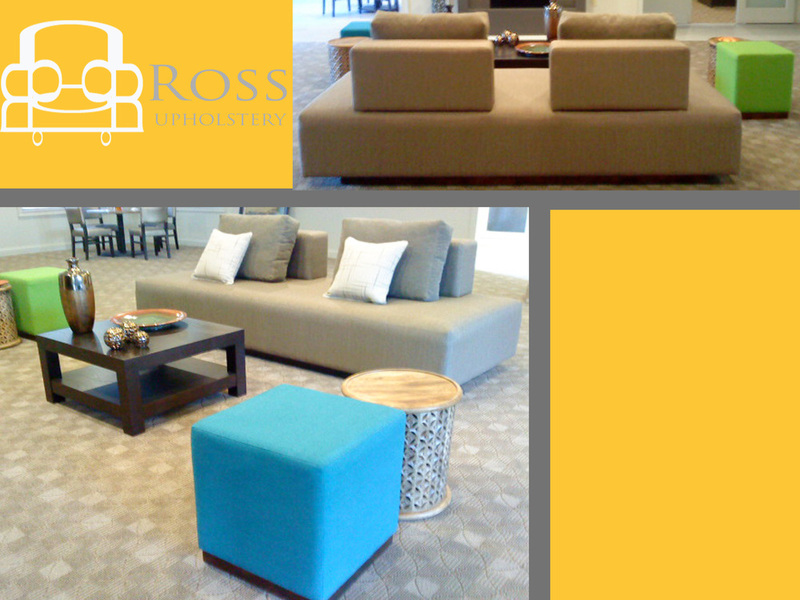 With more than four decades of expertise, Ross Upholstery has helped businesses refresh their image. Whether it be a custom built piece, or standard reupholstery of existing furniture, we are committed to giving you a look that will meet your needs and expectations. We have been fortunate enough to work with wonderful interior design companies on projects for restaurants, hotels, casinos, apartments, professional buildings, universities, hospitals, doctor and dentist offices, and many more. As part of Ale Emporium's renovation, we built and upholstered more than 20 custom booths, backrests, and benches. In addition, we also built an elevated platform for some of the booths near the bar. This is a custom built and upholstered sofa, and ottomans for an apartment complex in Indianapolis. In addition to these custom built and upholstered round benches, we also built and upholstered a couple of rectangle benches for Planet Fitness.